Next year, the Korean drama industry goes neo-retro with two music-centric series ― “Dream High” (a working title) and “What’s Up” ― bringing the classic song-and-dance genre to the small screen. The success of “SuperstarK” ― a reality show that is oft-described as the Korean version of “American Idol” ― signals the time is ripe for such performance-heavy dramas. The question is: Will audiences take to the genre as a miniseries? While “Glee,” an American television show about a glee club of teenage underdogs, became a major hit when it reeled out catchy song-and-dance numbers in 2009, it failed to make a similar impact on Korean viewers when it aired on cable channel tvN the same year. When SBS put out “He’s Beautiful!” and “I’m Legend,” two series that centered on bands and included music performances, both failed to bring in high viewer numbers. So with two music dramas on the way, what should viewers expect? Lots of singing and dancing ― but in different formats, according to the shows’ PR officials. Because “What’s Up” is about a group of university students majoring in musical theater, theatrically-stylized numbers ― including pieces from major musicals like “Jekyll and Hyde” ― will bring a bit of old school pizzazz to the small screen. Meanwhile, it looks like “Dream High” is aiming for something more K-pop-heavy. According to the show’s representative, viewers will be tuning into brand new songs, freshly produced by Holym. Holym is a joint venture formed by Park Jin-young’s JYP Entertainment and Bae Yong-joon’s agency, Keyeast, of which Bae is a major shareholder. The company will be co-producing “Dream High” with entertainment goliath CJ Media. In other words, there is a good chance that Park’s expertise with churning out chart-topping singles will come in handy for producing “Dream High’s” soundtrack, and with JYPE’s idols ― four have been cast in the drama ― likely to be performing these songs onscreen, “Dream High” will probably have K-pop fans glued to their seats every Monday and Tuesday night, when the series starts airing on KBS 2 TV on Jan. 3. Park is also acting as music-and-dance producer for the series, further expanding his influence over the sound and look of the routines, though there will be a separate music director, said the PR representative. In “What’s Up,” the protagonists are university students majoring in musical theater. In “Dream High” characters are high school students attending a school of arts famed for producing some of Korea’s finest stars. So for both shows, singing and dancing will be a natural part of the classroom. 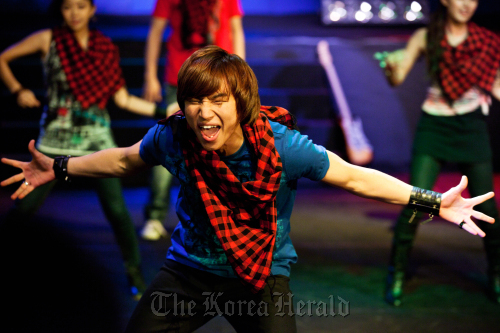 For “Dream High” characters will also be performing within the context of concerts. The similarities pretty much end there. If “Dream High” has all the hallmarks of a major production backed by industry giants and fronted by an all-star line-up of K-pop stars ― including 2PM’s Taec-yeon and Woo-young, Miss A’s Suzy and T-ara’s Ham Eun-jung and more ― then “What’s Up” should feel more like a well-funded, ambitious, indie-style endeavor. There is only one major K-pop star, Big Bang’s Dae-sung, on board. The PR for “What’s Up” is being conducted in a trendy, get-straight-to-the-masses manner, via YouTube, where an eye-catching teaser chock full of dramatic dance scenes and a dash of melodramatic angst drew over 200,000 hits. “We’re preparing the second teaser, which will feature behind-the-scenes clips of the cast receiving training for the drama,” the drama’s PR representative said over the phone. Furthermore, “What’s Up” also publicly held open auditions through micro-blogging service me2DAY, inviting audiences to emotionally invest in and also take a stab at starring in the drama themselves. According to a production company representative, a total of 10 finalists ― whose pictures are posted on the me2DAY audition site ― made it through. “Dream High” also held open auditions, but only one, a b-boy, out of about 1,500 made it through ― a result that somewhat undermines the appeal of open auditions, where the masses feel more than a few could be given a fair chance at fame. But while “What’s Up” may have a huge online following through its various Internet outlets, the drama has yet to establish a timeslot and broadcasting network, leaving audiences wondering when they will finally get to see what all the hoopla is about. According to the PR representative, plans are to get it airtime in the first half of 2011, which means that filming for the drama, which started this July, should be over by then. With “Dream High” likely to hit audiences first, “What’s Up” may be hard-pressed to draw in ratings, once the shine of the TV musical genre has worn off. But what the drama may lack in star power and timeliness, it promises to make up for with authenticity, talent and top notch technology. Famed “Hourglass” scriptwriter Song Ji-na will be fleshing out the characters and adding meat to the story. The drama will be shot on a state-of-the-art Red One camera at the Chungkang College of Cultural Industries School of Musical Theater, with the college’s own musical theater students rounding out the cast to give that extra, believable “oomph” to the routines. According to a production company representative, a tight team that includes a music director, a vocal teacher and a Chungkang College professor in charge of choreography will be putting out the song-and-dance numbers. Furthermore, Dae-sung, who racked up musical theater experience in “Cats” and “Shouting,” will be backed by musical actors Oh Man-seok and Jo Jeong-seok. The whole setup recalls “Glee,” whose success is due in part to the synergy of choreographer Zach Woodlee and a cast filled with actors and actresses off Broadway. Can viewers expect to see traces of “Glee” and musical films like the Disney Channel’s “High School Musical” franchise in “What’s Up”? The production company representative said over the phone that those shows had influenced them a little. But don’t expect a tale of underdogs who find solace in song-and-dance, warned the representative; “What’s Up” has its own story to tell.